Don't damage acrylic (Perspex) windows by using ordinary household window cleaners. 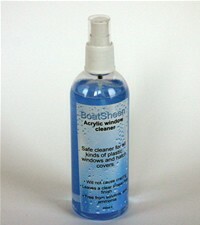 This specially formulated cleaner leaves a clear smear-free finish on Perspex windows on boats and caravans and hatch covers without damage. It's also good on mirrors and glass. "Just a note to let you know that I have received delivery of my order. Thank you so much for your prompt service, it is very much appreciated. Hope you all have a wonderful Christmas."